All our guides are highly trained, professional Scuba Instructors and Divemasters – they combine safety, years of experience and in-depth knowledge of the underwater world to provide you with the ultimate Dive Cabo snorkeling experience. Check in is at 8:45 at our shop, and we aim to get back from the tour at around 12:00. Please bring swim wear, towels and sunblock – water and snacks are provided on the boat. This tour includes a free photography service – our guides are equipped with GoPro cameras and will take pictures of you and the marine life for free. Please bring a USB memory stick for easy data transfer – we can also airdrop the pictures to iPhones. You are also welcome to bring your own cameras. 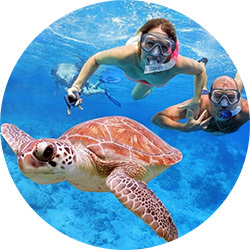 Have a custom snorkel boat to yourselves – enjoy observing the underwater world with friends and family with your own highly trained, professional Scuba Instructor or Divemaster on our private tour. We’ll take you to some of the area’s most picturesque hidden hotspots away from the crowds, giving you the chance to get up close and personal with the marine life and landscapes that are the reason snorkeling in Cabo San Lucas and the Corridor is a special experience. Our private tour can be customized to your needs – whether you prefer to relax on Lover’s Beach, or swim amongst the fish at Pelican Rock – we will adjust accordingly, and moreover, give you the perfect Dive Cabo snorkeling experience, as well as memories to last a lifetime. Upon request, we also offer food and beverage specials. Please contact us for more details. Check in for the morning tour is at 8:45 and for the afternoon tour at 13:45. Please bring swim wear, sun block and towels. Your snorkel guide will be equipped with a GoPro and will take pictures of you and the marine life for free. Please bring a USB memory stick for easy data transfer – in addition we can also airdrop the pictures to iPhones. Likewise, feel free to bring your own cameras to capture the experience.